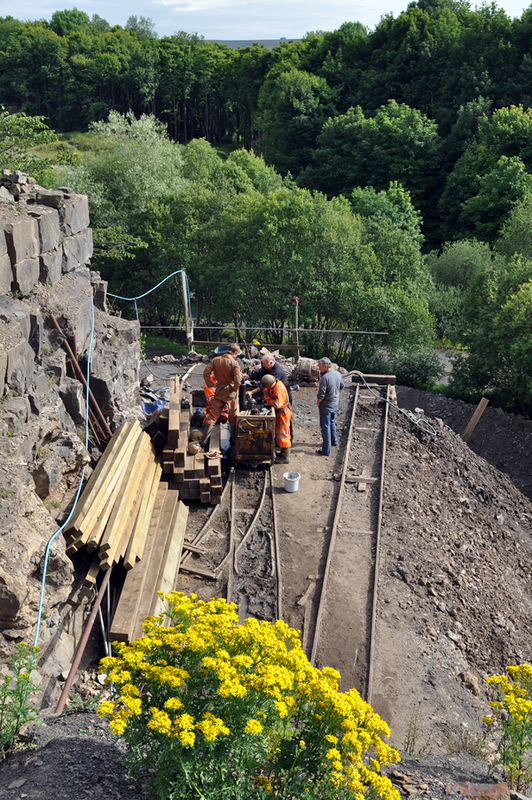 The last few weeks were very busy for our team. 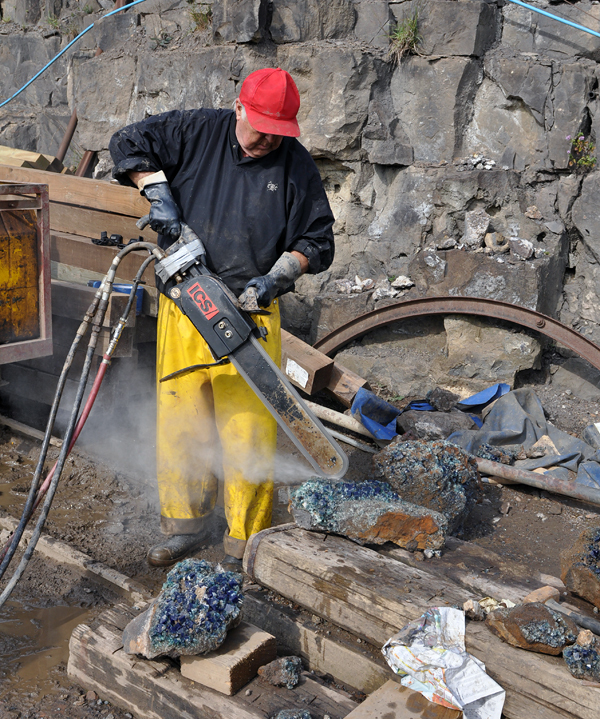 Parallel with publishing Minerals #2, and editing the book “Agates from Ploczki Gorne, Lower Silesia, Poland” we were working on Mindat.org Conference and preparing for Sainte-Marie-Aux-Mines show. Finally everything went well, but at the end of the Conference I was really exhausted. I was dreaming about some real holidays – somewhere with no hurry – either under or over ground collecting. 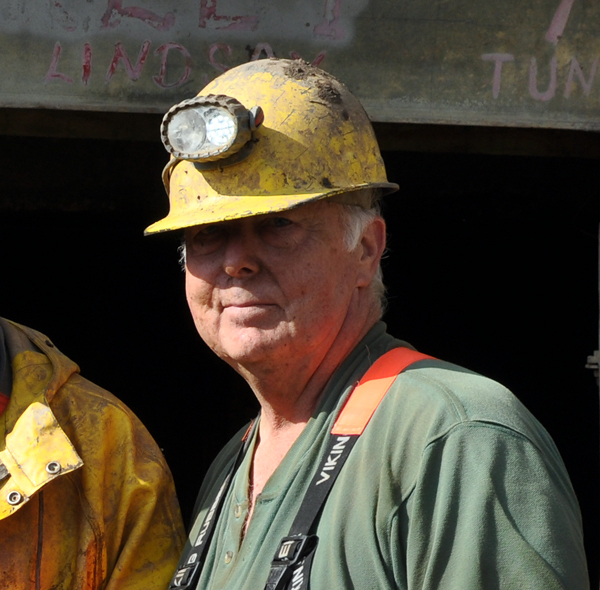 A great opportunity showed up just before end of Conference – Cal and Kerith Graeber invited us to visit the Rogerley mine again! 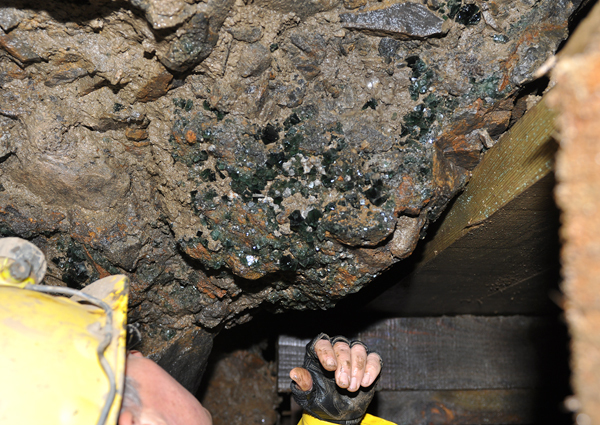 Reason was simple – they just hit a new pocket which produced several good quality specimens. They still didn’t know much about overall size and quality of pocket. 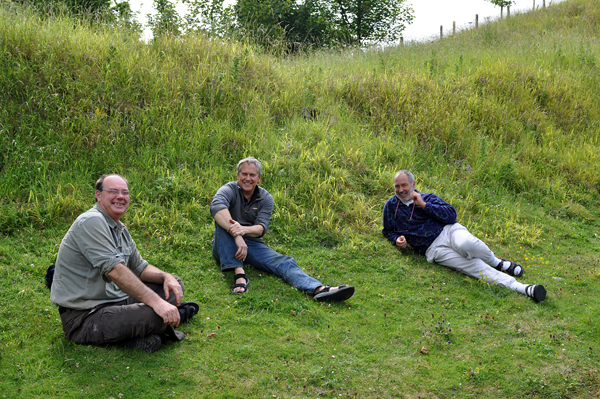 We decided immediately to go and 5 days after Conference we – Scott, Kristof and myself – were in Northern England. Unfortunately for us, Asia was enjoying the beaches in Croatia, so the photography portion of this report is not up to normal standards. It was difficult to take pictures while playing in the mud! The last year was very hard for UKMV team – they lost their good friend and main miner, in addition to not hitting any important pockets etc. 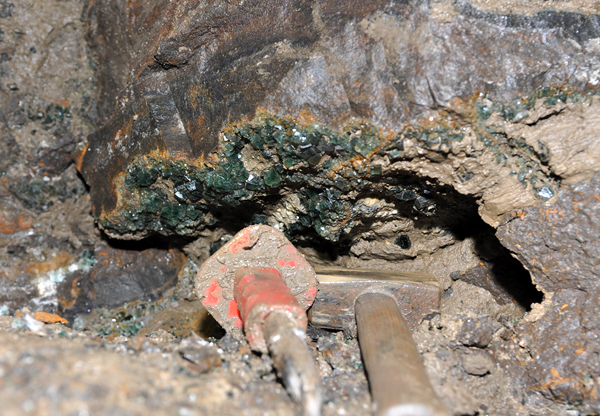 This year was kind of an „exam“ for the mine – they were even thinking about leaving project! 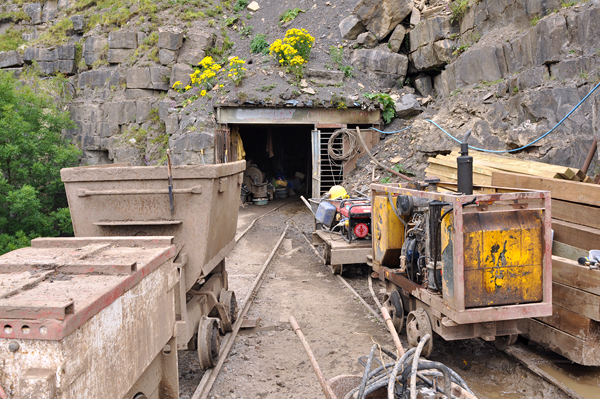 Fortunately in the middle of season they hit a new pocket, which will perhaps prolongate mine activity. 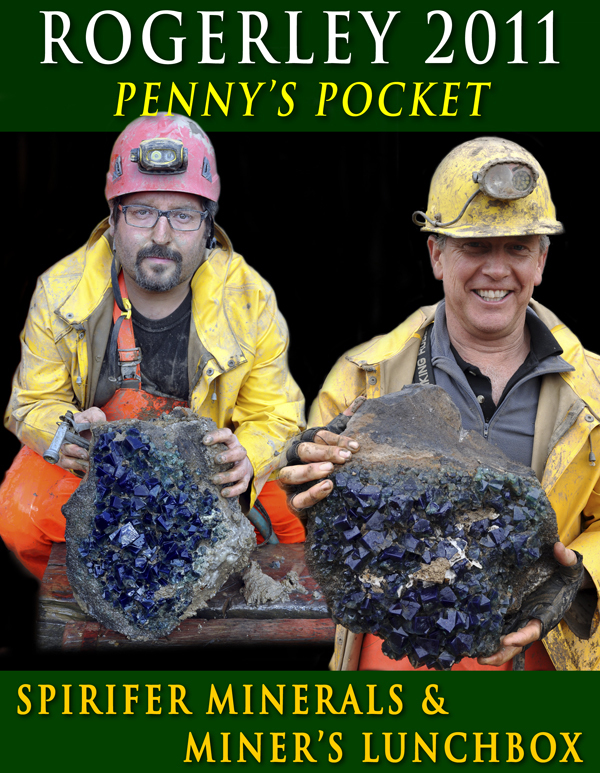 The pocket was named „Penny’s Pocket“ in the honor of Penny Williamson – Curator of Geology, University of Wollongong, and Vice-President of Society of Mineral Museum Professionals from Australia. She had just visited the mine when pocket was found! She stayed there only a few days, so probably before reading this report she didn’t know how good Penny’s Pocket really was! 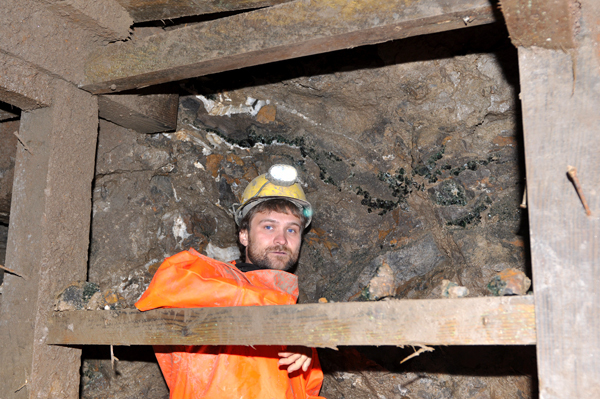 During our stay it was shown that pocket is about 4-4,5 meter long, and at least 1 meter deep. 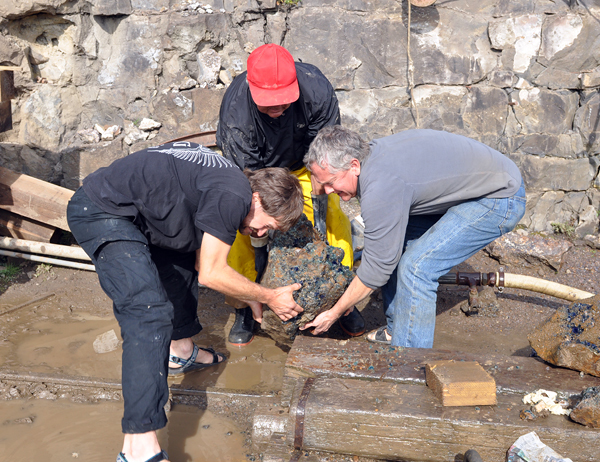 Hopefully with additional work it will produce more specimens and we especially hope that it will be much deeper than it was when we had to leave. Penny’s Pocket, as all important pockets in Rogerley, is brecciated and filled by mud. 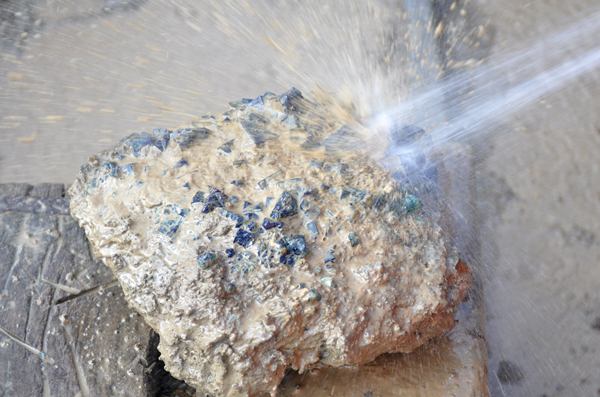 In general there are 2 kinds of mud – a soft clayey one and a hard calcified one. 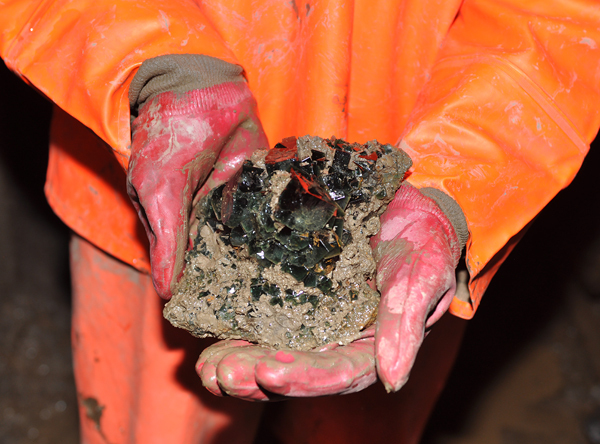 All crystals are frozen in one of these two kinds of mud and have to be extracted very carefully. Unfortunately, a majority of specimens were previously damaged during a brecctiation episode. 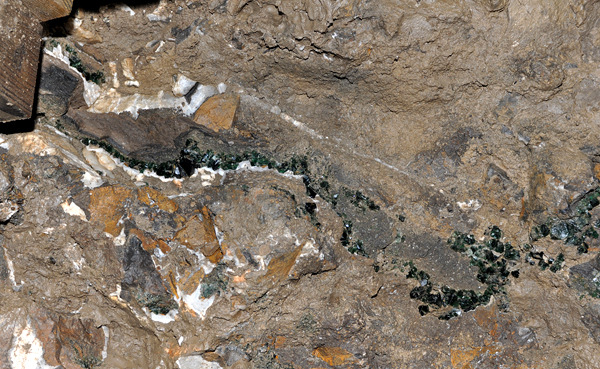 Fragments of breccia are from a few centimeters to over a meter in size. 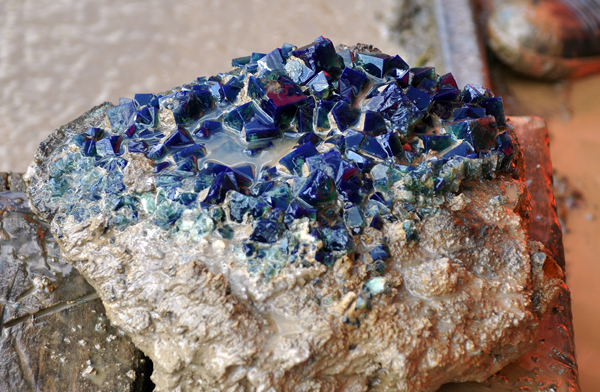 The majority of them do not have crystals on surfaces. 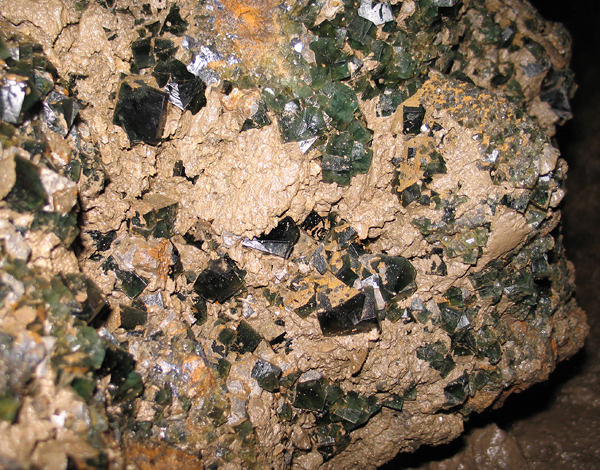 Only in select horizons do blocks occur partly coated by crystals. The biggest specimens reach almost a meter but they need serious trimming to become a really good specimen. 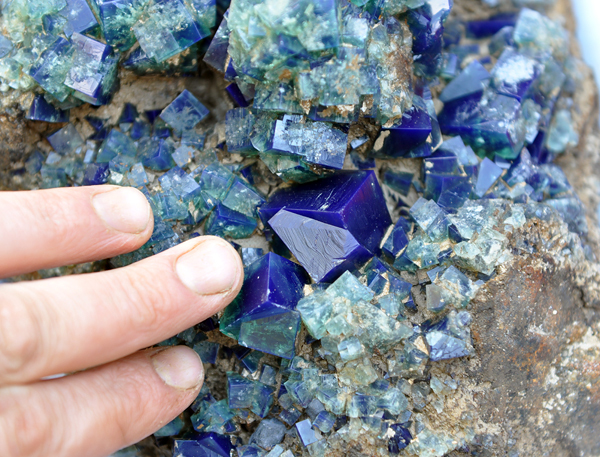 Size of crystals varies from a few millimeters to about 3-3,5 cm on an edge. 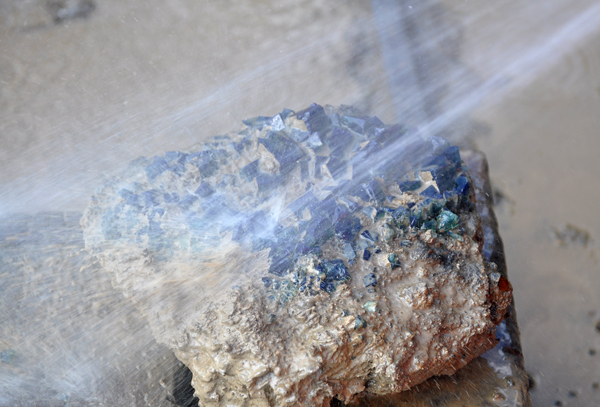 The majority of crystals are twinned, with good or medium luster, very gemmy and with incredible daylight fluorescence (the best possible). 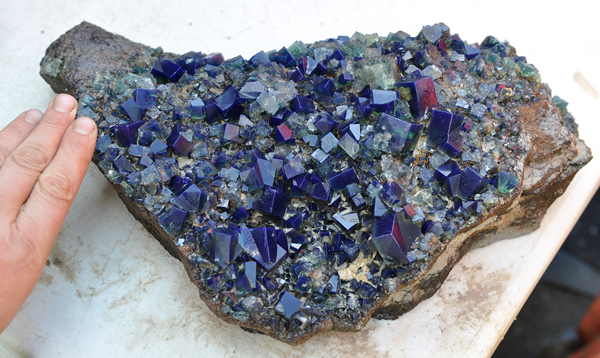 They have growth hillocks typical of Rogerley fluorite. 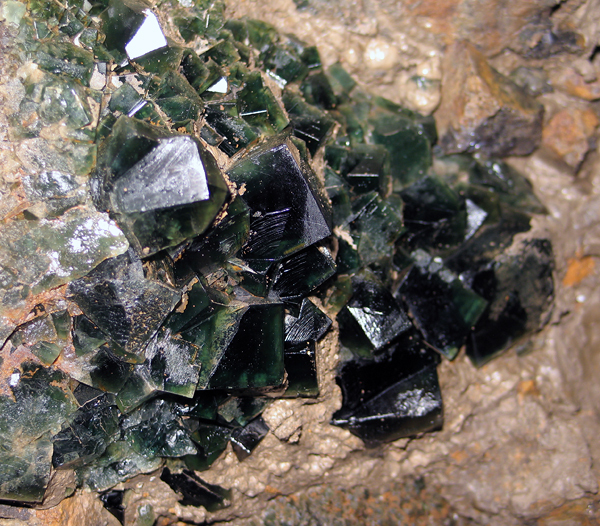 Untwined crystals are quite rare and usually not very good quality. 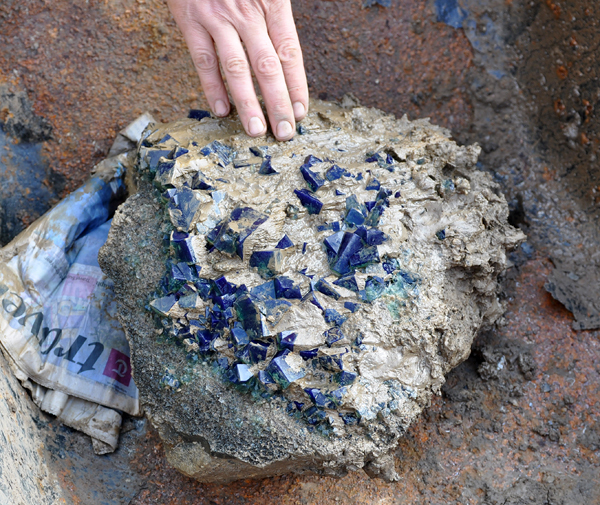 The biggest fluorite collected during our stay was about 4 cm on edge. 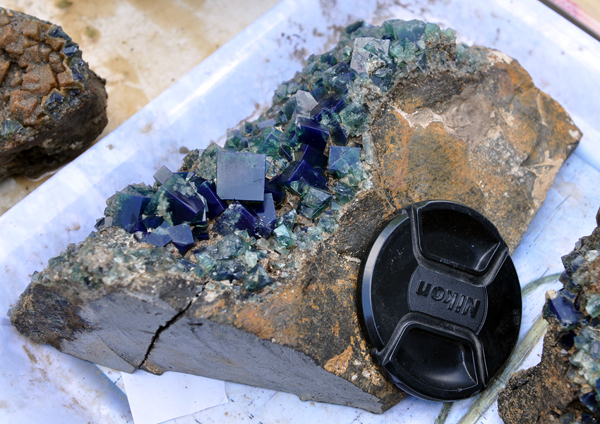 During collecting we discovered one very unusual block partly covered by small and partly by big fluorite crystals. 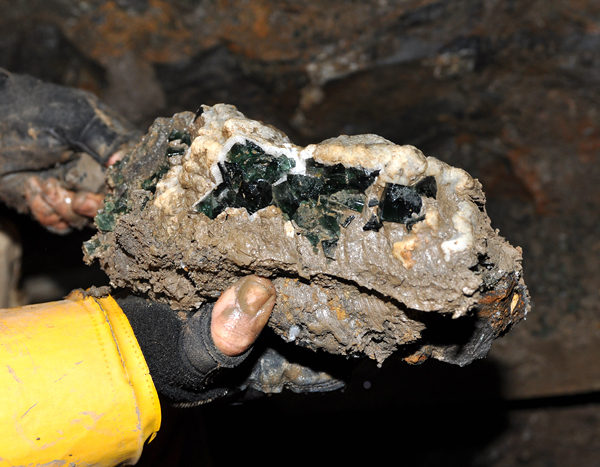 Shape of the block retains the shape of a coral colony, and some of us suspect that maybe this is hydrothermally prepared coral later overgrown by fluorite! 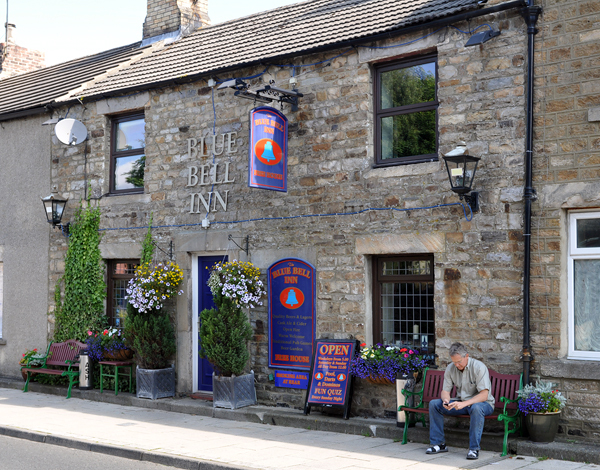 Evenings we spent (of course) in the famous Blue Bell pub tasting great local beers and whiskies. 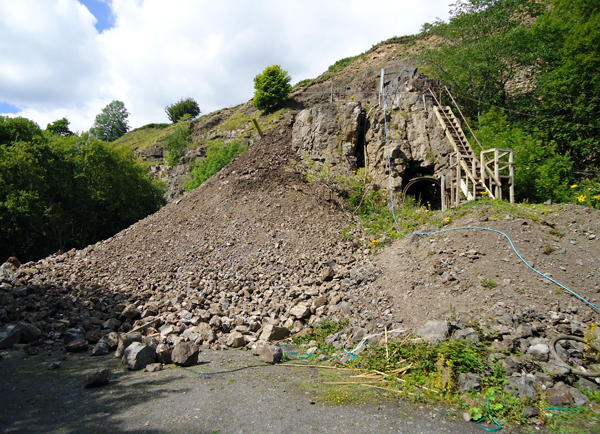 One day we also made a short tour to see remains of famous mining operations in the area. However some invisible force pushed us quickly back again to the Rogerley mud. 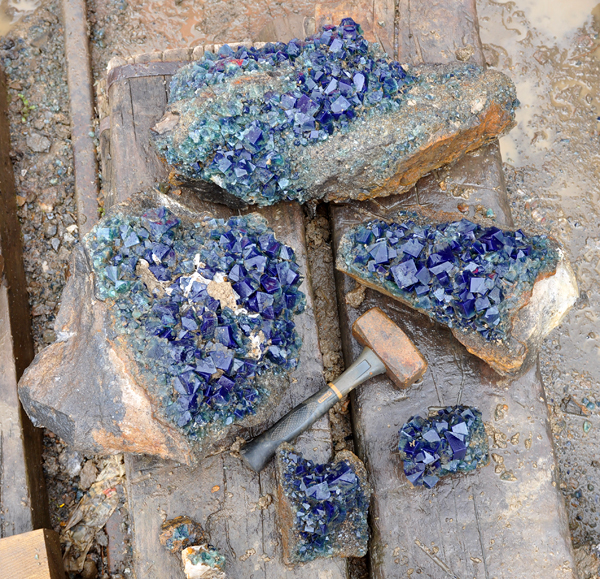 Altogether we spent a great time with friends, mud and fluorites. 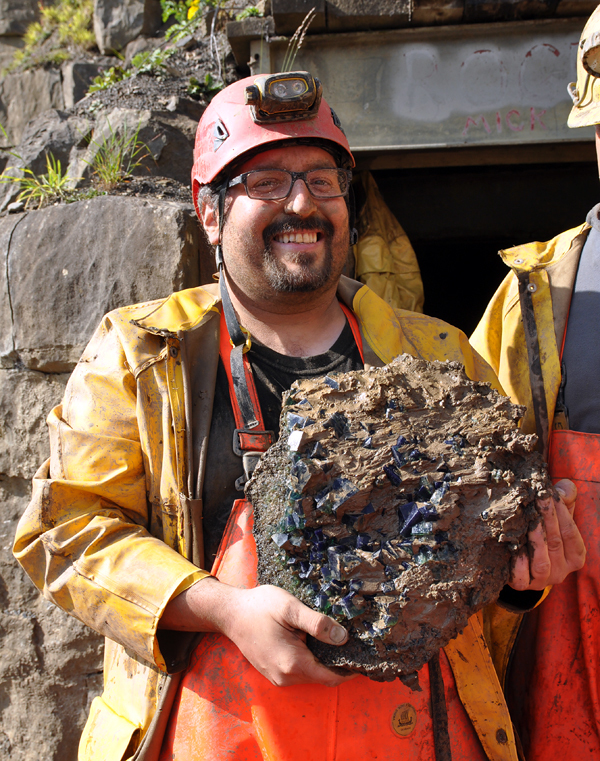 Of course self-collecting world-class specimens is an unforgettable experience, as is bringing them for the first time to daylight where they show incredible blue color (daylight fluorescence). During our stay we had the chance to collect many specimens, several of which were really good and unusually big. Cal and Kerith, thank you very much for the invitation! These were the best holidays you can imagine! See Rogerley specimens on our ebay. Penny Williamson (pocket name was given in her honor) with Amir Akhavan and Brian Jackson at the Mindat.org Conference in July 2011 in Poland. R. Bode photo. 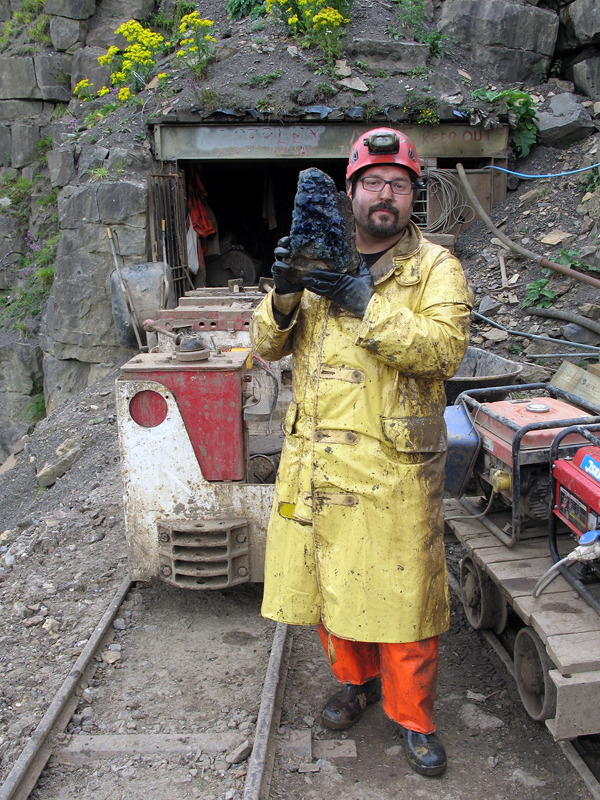 Cal Graeber - one of the owners of the Rogerley mine - invited us for this great trip. T. Praszkier photo. 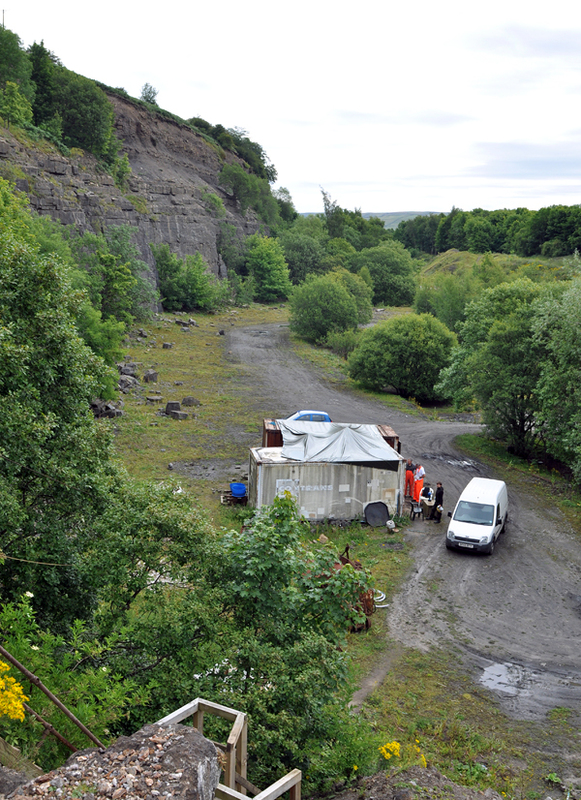 Mine "offices" at the bottom of the quarry. T. Praszkier photo. Lower tunnel and the stairs to the main entrance. S. Werschky photo. 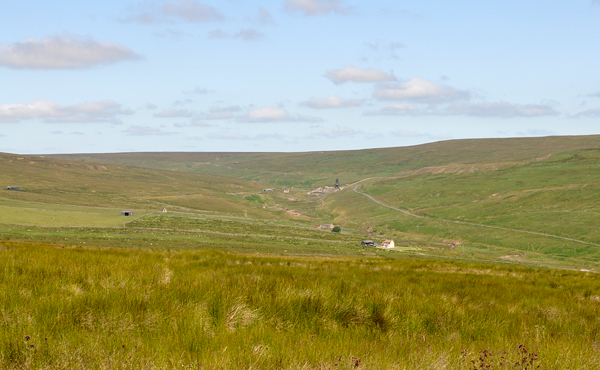 Beautiful day in Weardale! T. Praszkier photo. 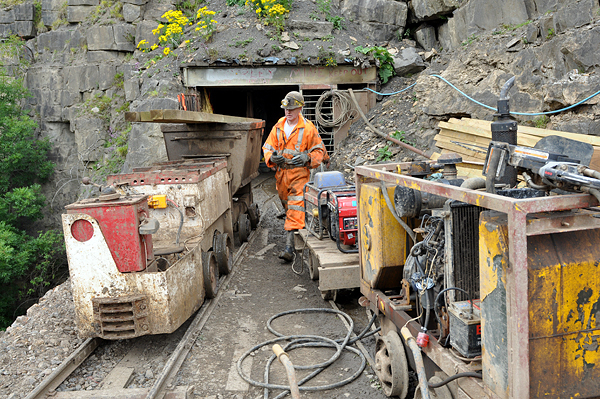 Mine entrance with the mining trams. T. Praszkier photo. Transporting rocks to the dump. S. Werschky photo. Transporting rocks to the dupm. S. Werschky photo. 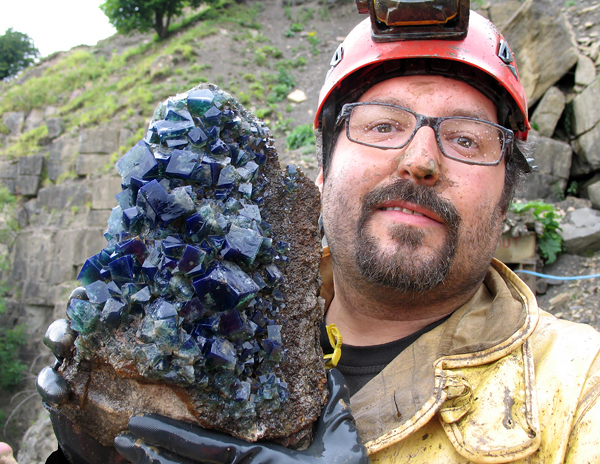 Scott looks at the fluorite. T. Praszkier photo. 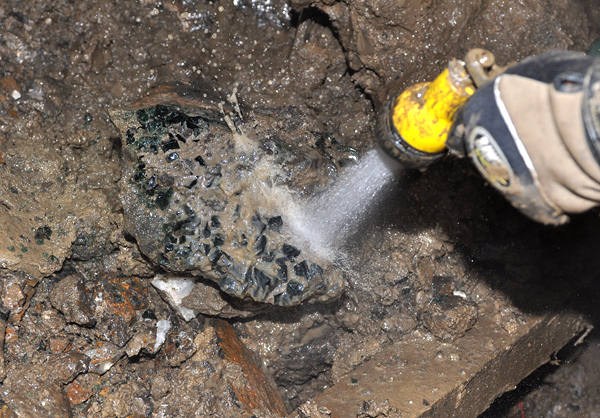 Crystals frozen in cemented mud. T. Praszkier photo. Fragment of Penny`s pocket behind Kristof. T. Praszkier photo. 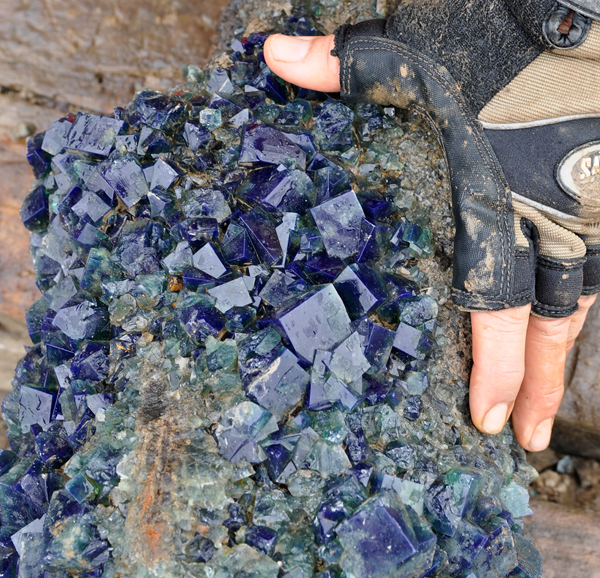 Fluorites in the wall! T. Praszkier photo. 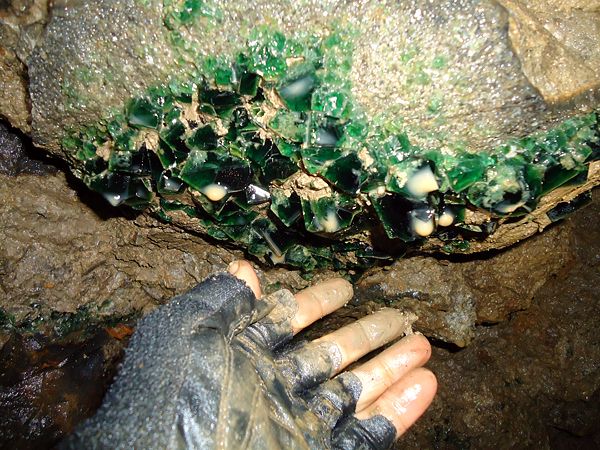 Some of them were coated by calcite. T. Praszkier photo. Crystals sticking out from the clay. K. Dembicz photo. 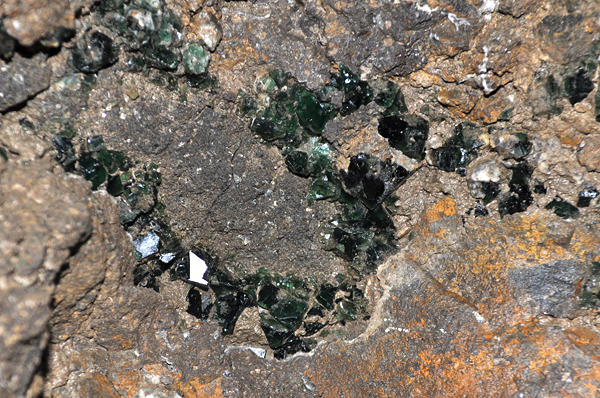 Fragment of the pocket. T. Praszkier photo. 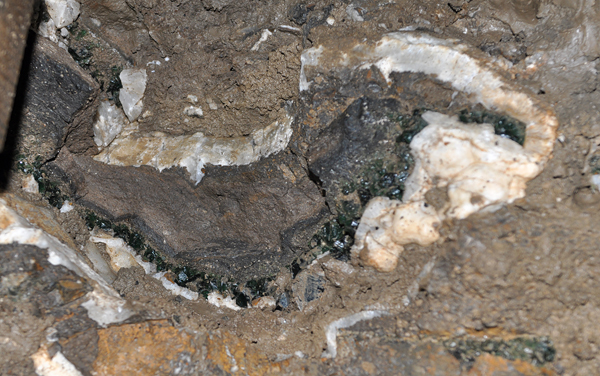 Small cavity after the clay was cleaned. T. Praszkier photo. Scott working in the pocket. T. Praszkier photo. First specimens. T. Praszkier photo. 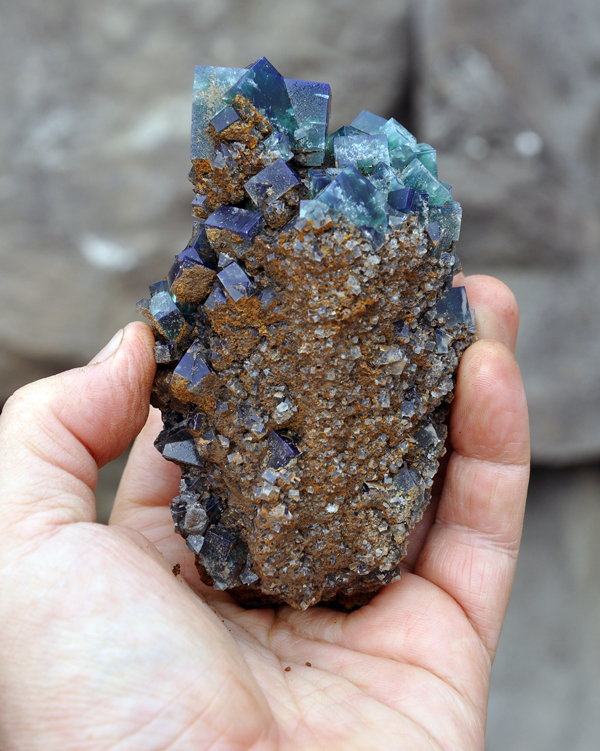 Fluorite crystals partly covered by calcite. T. Praszkier photo. Water is a very important tool in Rogerley. T. Praszkier photo. Freshly collected specimen. T. Praszkier photo. Perfect twinned crystals sticking from the mud. K. Dembicz photo. One of the biggest specimens that we managed to get out of the wall on the first day. S. Werschky photo. 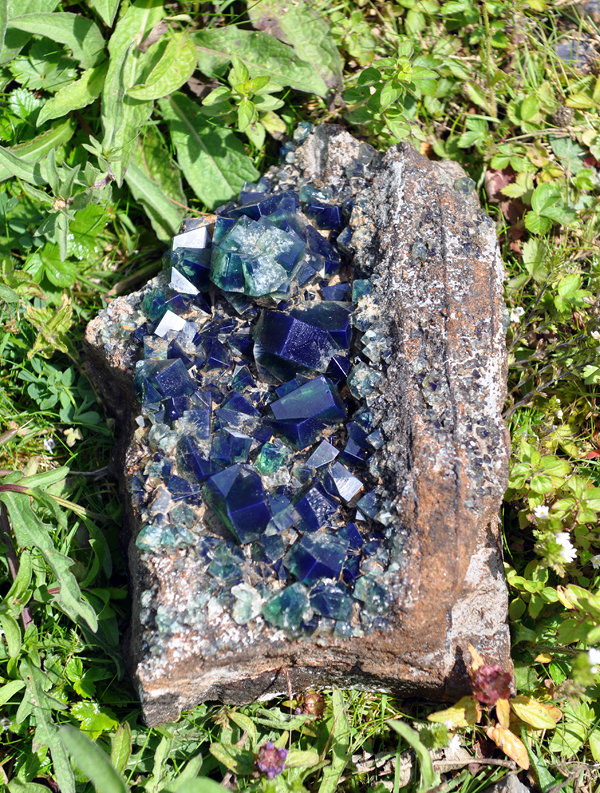 The same specimen (in situ on the photo above) - first time in daylight. T. Praszkier photo. 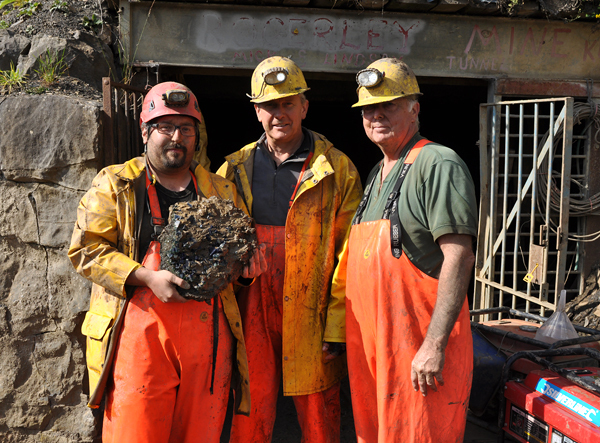 Tom, Scott and Cal with the specimen at the mine entrance K. Dembicz photo. 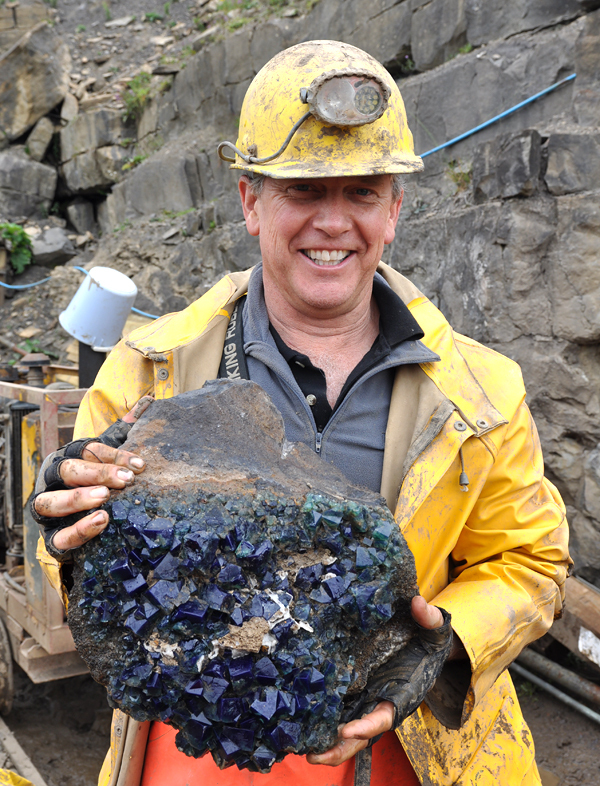 Happy Tom with the dirty fluorite. K. Dembicz photo. Time for bath! K. Dembicz photo. Much better! K. Dembicz photo. 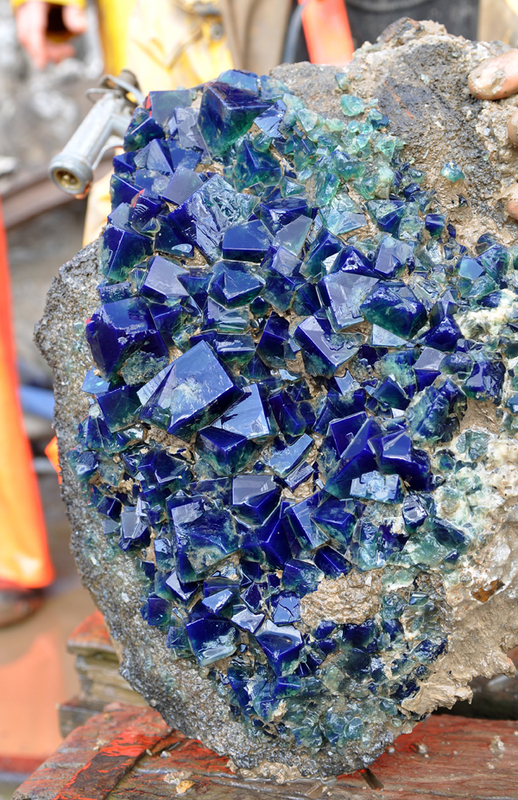 Quite impressive color and size of crystals after cleaning. K. Dembicz photo. Another specimen from the Penny`s Pocket. T. Praszkier photo. Classic twin with very high daylight fluorescence. T. Praszkier photo. Great blue color of twins. T. Praszkier photo. 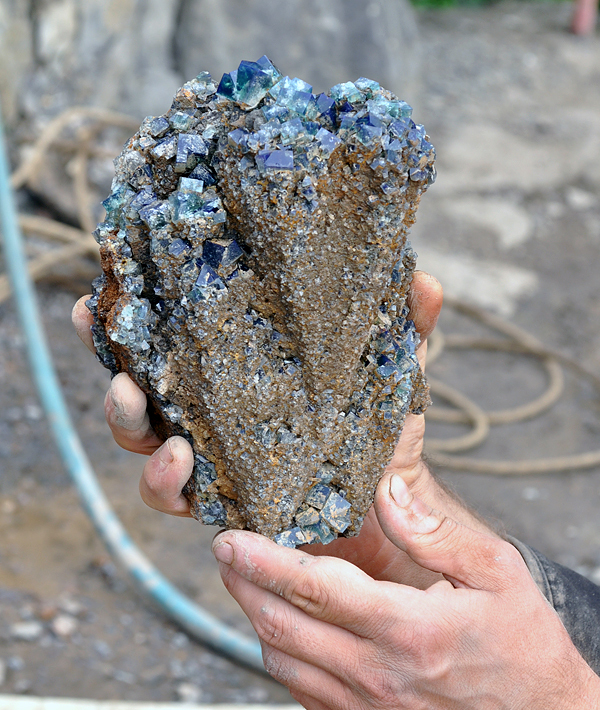 One of the best (so far) specimens collected from the pocket. T. Praszkier photo. 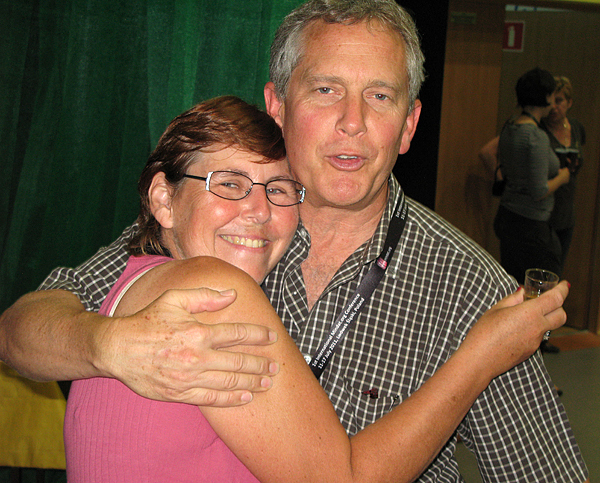 Kristof with specimen from the photo above. T. Praszkier photo. 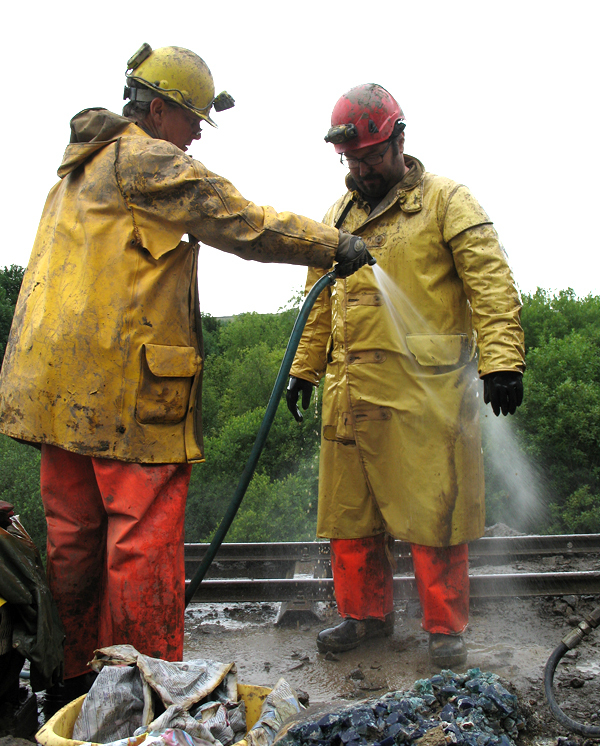 Washing after day of work. K. Dembicz photo. Famous Blue Bell pub - Scott is ready for the beer after work. T. Praszkier photo. 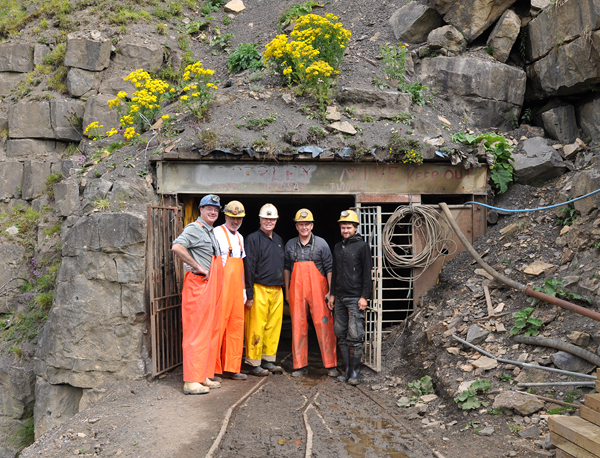 During short trip we visited some of the classic mining places in the area. 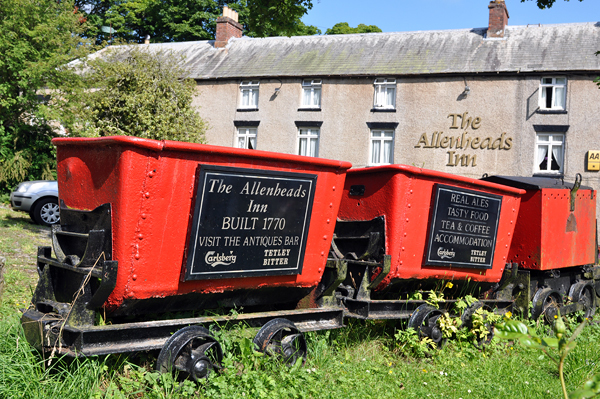 Old mining carts in Allanheads. T. Praszkier photo. Dumps in Frazer`s Hush. T. Praszkier photo. 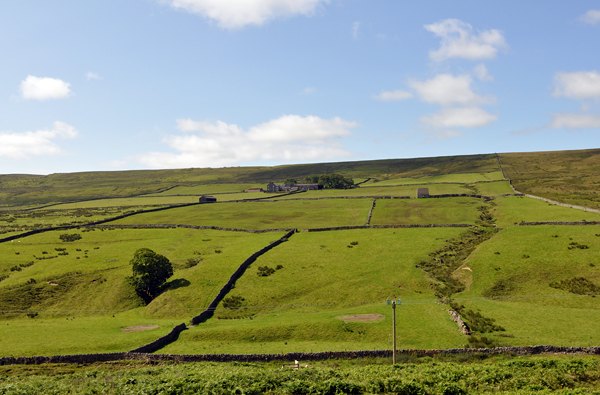 Classic landscape in Weardale. T. Praszkier photo. 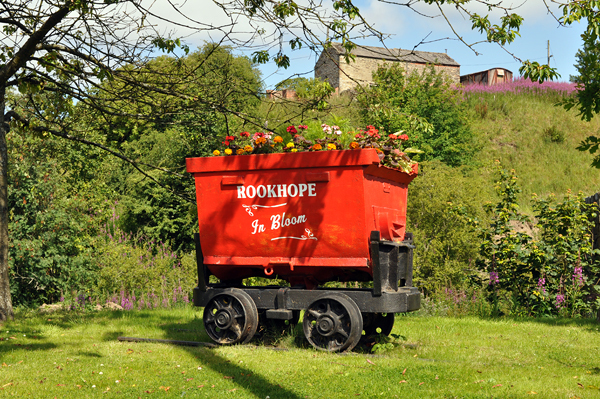 Old mining cart in Rookhope - famous for Boltsborn mine. T. Praszkier photo. 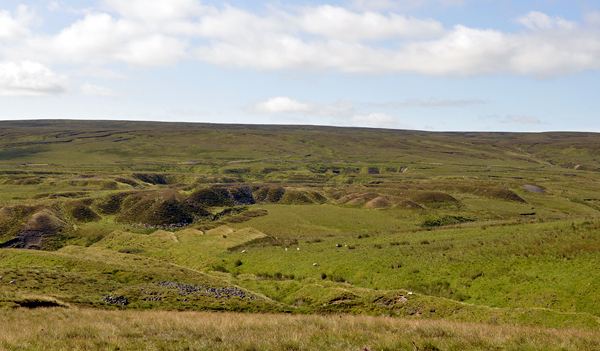 Picturesque valley - note the head frame at the center. T. Praszkier photo. Mark Kielbaso, Scott Werschky and Jurgen Tron being lazy and sleeping on the sun! T. Praszkier photo. Mark, Jurgen, Cal, Scott and Kristof at mine entrance. T. Praszkier photo. Kristof examining the pocket. T. Praszkier photo. Jurgen washing the pocket. T. Praszkier photo. 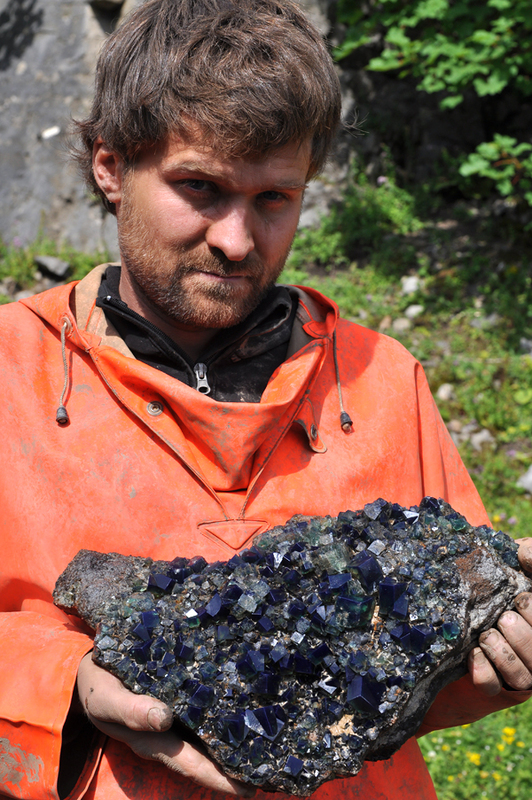 Scott with exposed group of fluorite crystals. T. Praszkier photo. 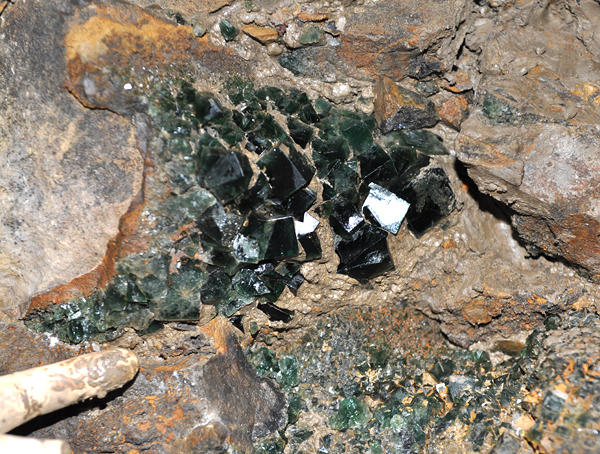 Fluorites in situ! T. Praszkier photo. 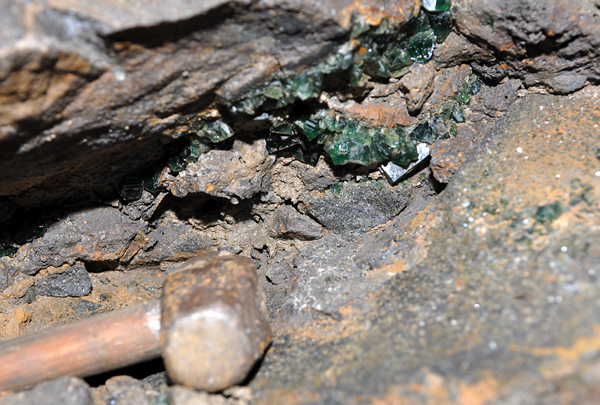 Fluorites in situ! K. Dembicz photo. Very happy Scott with his micromount. T. Praszkier photo. 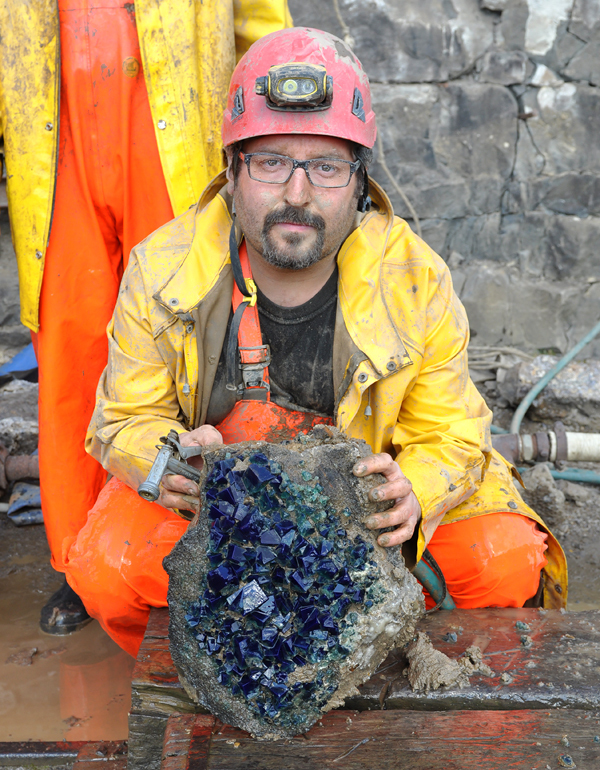 Mining fluorites is a dirty job - but it was worth it! K. Dembicz photo. Dirty and happy Tom with one of the specimens. K. Dembicz photo. Some of the big specimens. T. Praszkier photo. One of the biggest rocks... T. Praszkier photo. 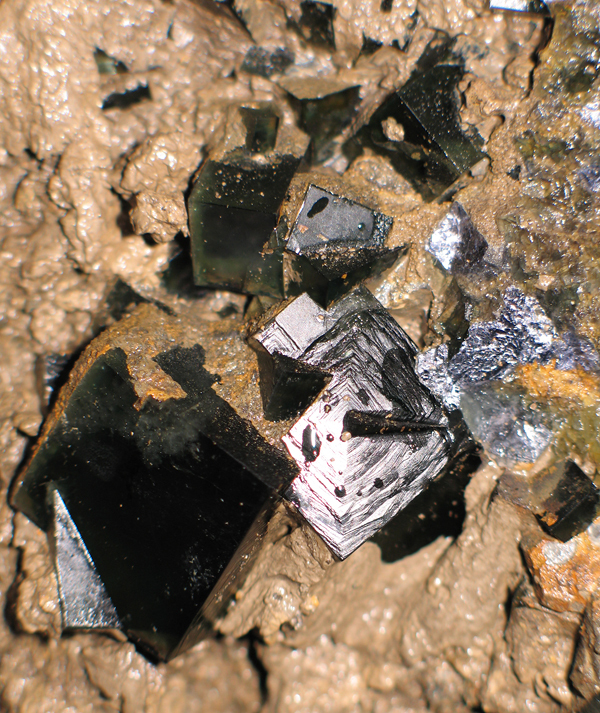 ... with great crystals of fluorite with galena. T. Praszkier photo. Time for trimming! 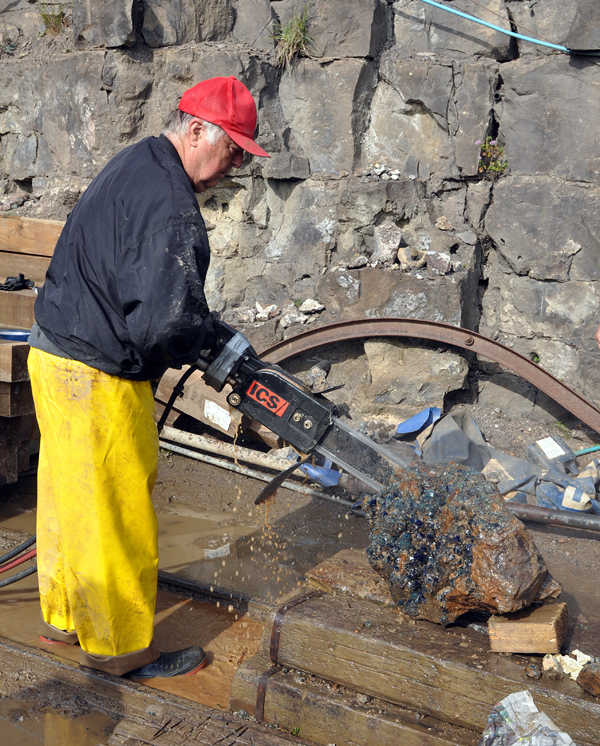 Cal is sawing one of the big specimens. T. Praszkier photo. 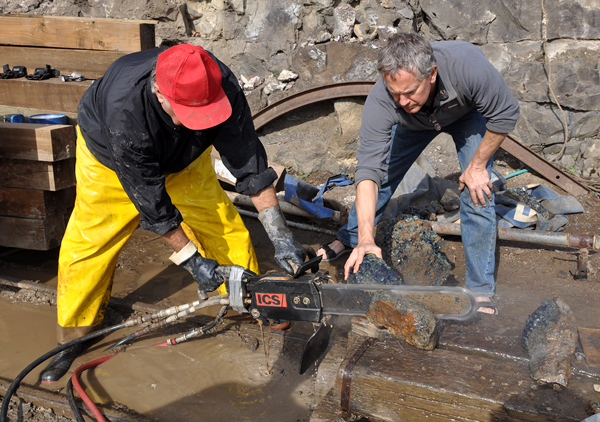 Sawing specimens. T. Praszkier photo. Some of them were really heavy. T. Praszkier photo. Sawing the biggest one. T. Praszkier photo. To cut the smaller specimens Cal had to sit on the saw. S. Werschky photo. Unusual find - probably etched corals overgrown by fluorite. T. Praszkier photo. Another specimen of ?coral overgrown by fluorite. T. Praszkier photo. Time to say goodbye after 5 great days! T. Praszkier photo. And thank you Penny for the great pocket! R. Bode photo. Did I see a 2nd portal (with an arched profile) under the staging area to the upper portal? What`s the story with that portal? Perhaps we`ll meet at one of the shows if you ever make it state-side, Tomasz. 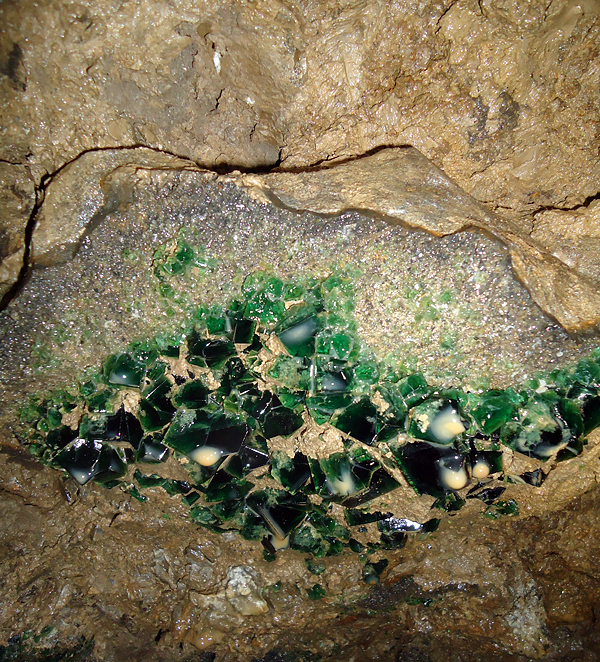 I am happy you liked the report, I am not sure if I understood your question well, but the lower entrance to the mine was the first one - beacuse the upper zone is more productive the mine was mooved there. 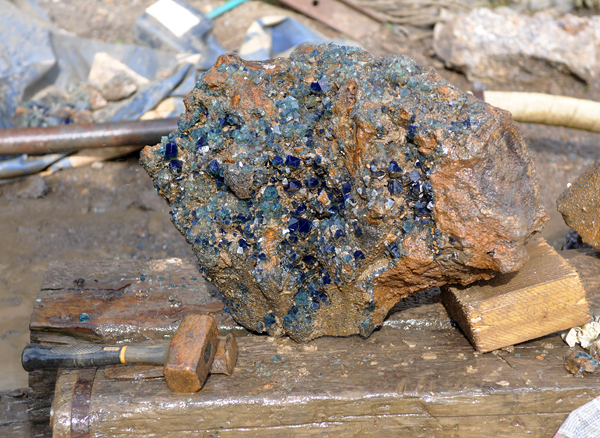 You can find a detailed story in the article about rogerley in Minerals #2 - http://spiriferminerals.com/92,MINERALS---The-Collectors-Newspaper--2.html (or pick it up in Springfield/Tucson/Denver from Scott). I hope to make it to Tucson next year so hope to see you there! 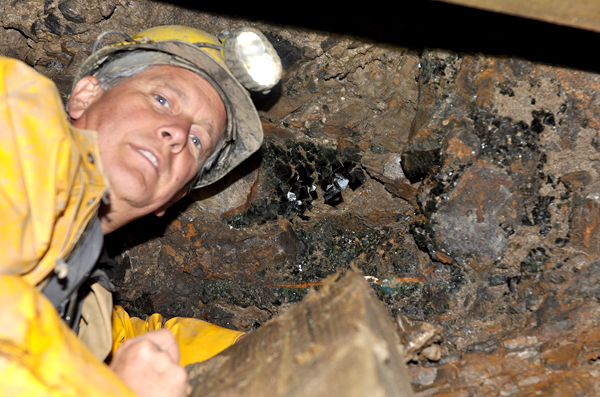 Very interesting, to have the opportunity to collect in the Rogerly mine must be a pure treat. Someday I would love to be able to collect in the types of localities you get to. Makes me jealous! Fine specimens you collected, someday I would like to get something of that quality, almost makes me want to send all of my specimens to the crusher (not the halite I got from you though, it is great!) Keep up the great reporting on your collecting. Send me a wish list from Missouri`s Viburnum Trend, still owe you a few specimens, let me know what your interestedd in.